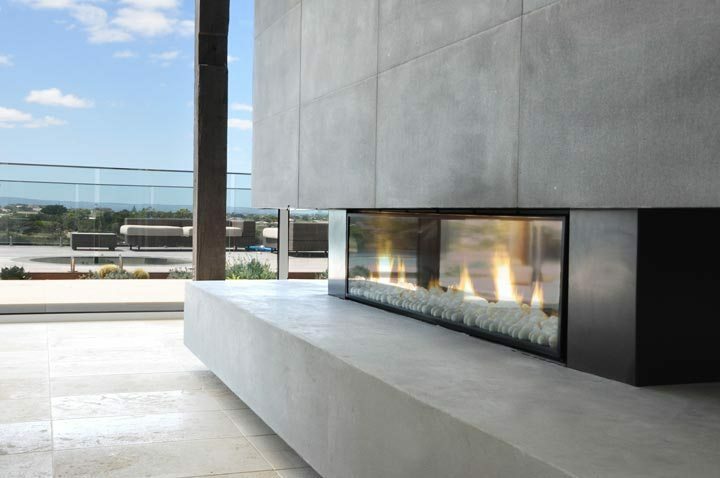 A combination of fire, water, metal and stone inspired a truly original design for this Melbourne, Australia holiday home. The sunny glass house designed by architect Richard Ekberg, channels the tranquil energy emitted by the natural materials within. 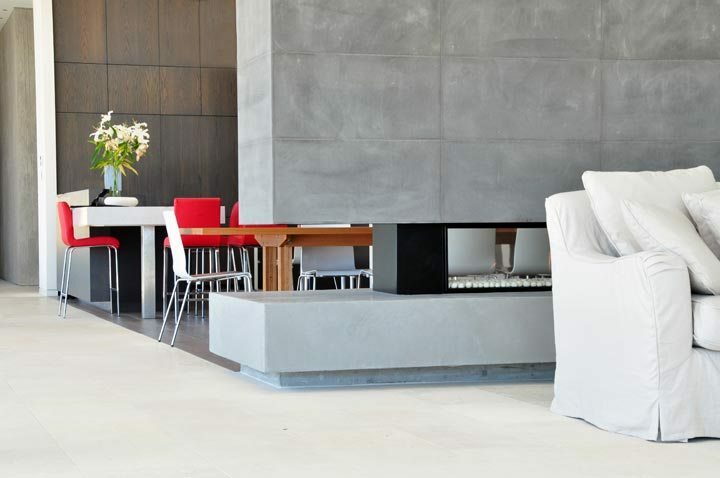 At the heart of the home, this master builder from Platform created a floating concrete centrepiece with a frameless gas log fire with a heat ducting system to heat the 30m long, open plan rooms with 4m high ceilings. 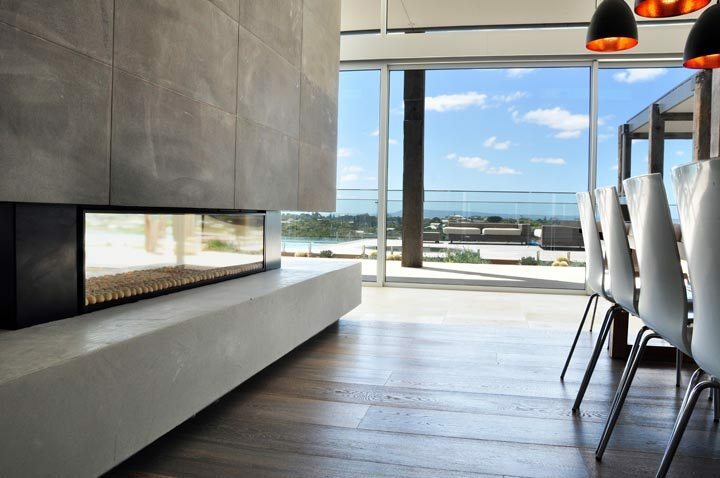 The project planning stage took some considerable brain power as the house was to be built into a sand dune and extends out towards the ocean for uninterrupted views. To create a seamless divide between the two landscapes, the backyard’s foliage mimics the native beach grasses. If you’re not impressed so far, what about adding a swimming pool, tennis court, gymnasium, 6 car underground garage, and an Olympic size trampoline into the mix. Inside the abode, 6 bedrooms and 6 ensuite bathrooms accommodates the family and their guests. Even with the plethora of extravagance and luxury, this family know what’s important to them. The chickens received a purpose-built chicken shed in the backyard and they even travel to go on holiday with the family too. 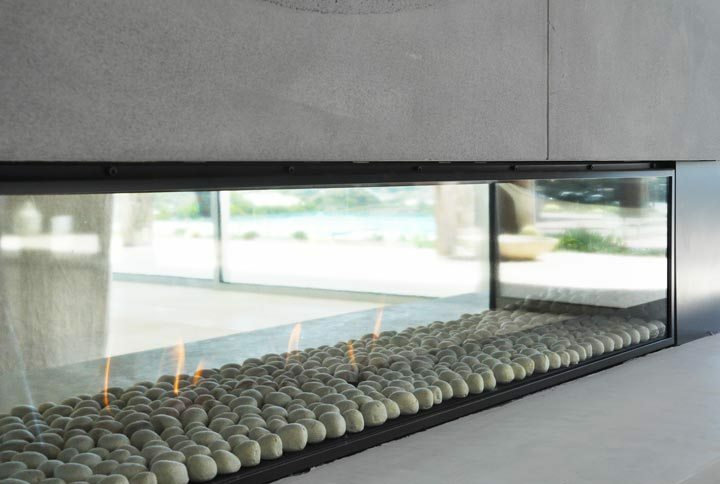 The Escea DX1500 is a ducted fireplace, so it was perfect to heat the long rooms. 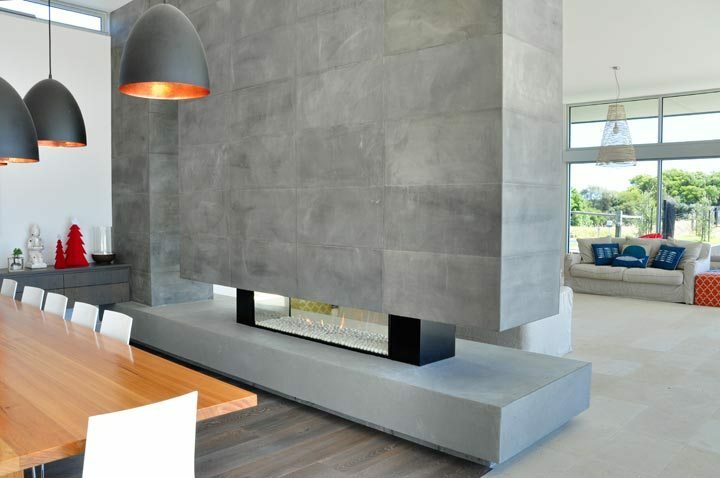 The designer decided to place all of the duct outlets into the same room to spread the heat evenly throughout the living space. Further, its ultra-wide aspect fitted with the long sleek lines of the interior elements. 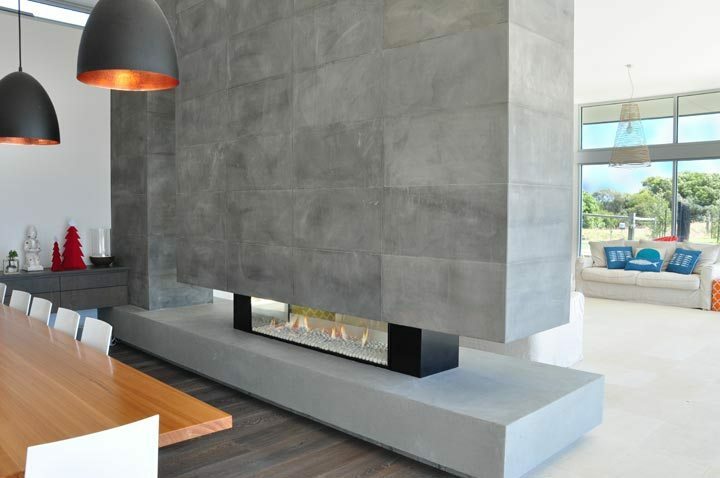 The white coal fuel bed complements the colour palette as well as being in line with the earthy tones. 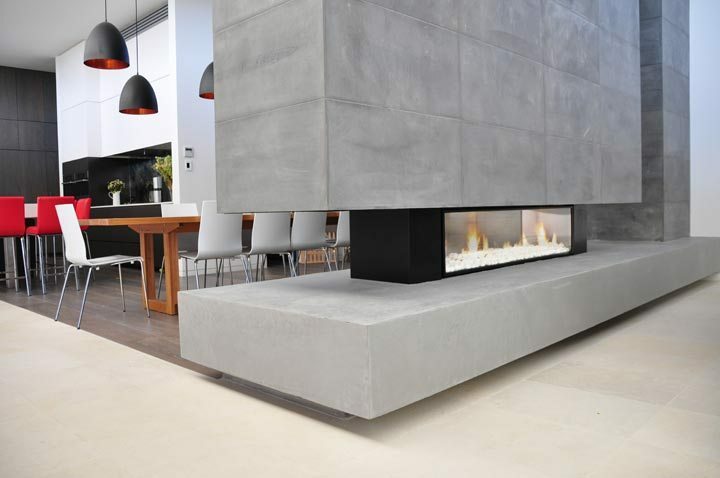 The double sided option means the fireplace provides flame for two living areas at once. It can be viewed from the dining area and the lounge area. 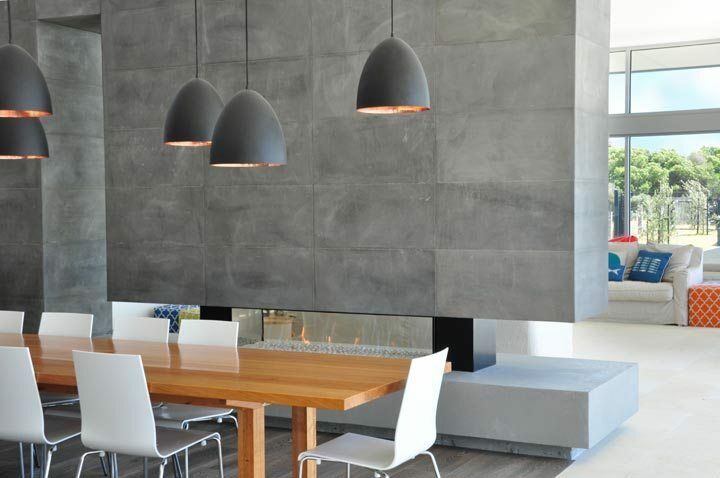 The homeowners wanted an industrial edge, which was executed perfectly with the hanging concrete slab housing the gas fire, the colour palette and the matte black pendulum lights hanging above the dining table. 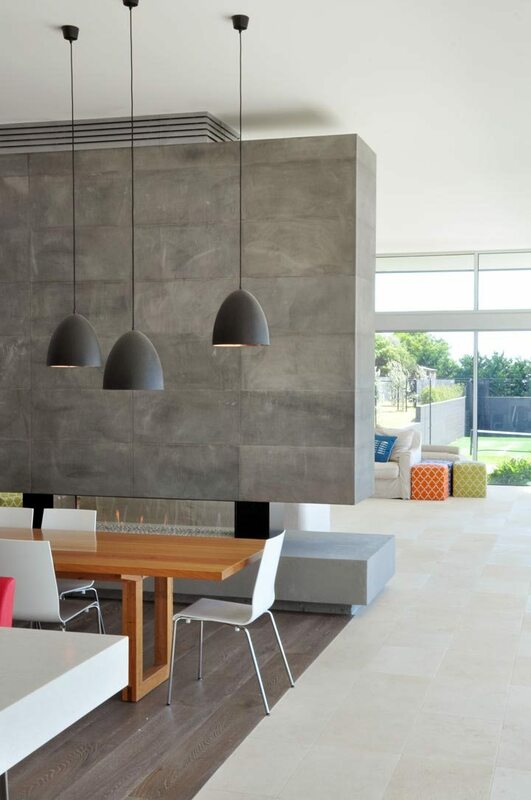 The neutral tone chosen for most of the components are elegantly complemented by the hints of colour. The red-copper underside of the pendulum lights is perfectly paired with the red kitchen stools. Even with the industrial edge, this holiday home offers an indulgent homey feel. You can almost feel yourself sitting on the sofa, staring out at the seaside with a book in hand.